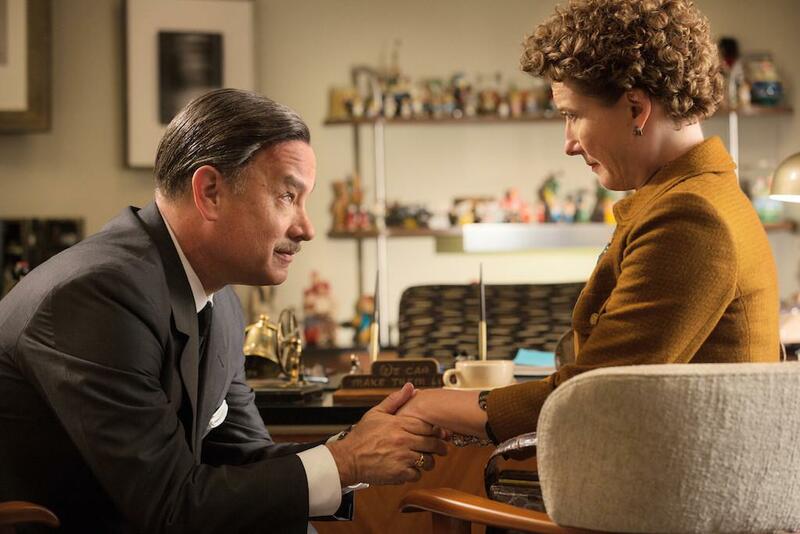 Saving Mr. Banks: true story? Fact and fiction in Walt Disney, P.L. Travers movie. Does Saving Mr. Banks Portray Walt Disney and P.L. Travers Accurately? The Oscar hopeful Saving Mr. Banks has already inspired much discussion about its accuracy—or inaccuracy, depending who you ask. The film, which opened wide this past weekend, chronicles Walt Disney’s struggle to secure the rights of the Mary Poppins stories from their author, P.L. Travers, mostly referred to as Pamela in the movie. The film was produced and is distributed by Disney and it has been called “sanitized”; some critics have called out the film for portraying a woman writer as, in the words of Mark Harris, “crazier, more oblivious, less self-aware” than she really was. The film, to be sure, omits a good deal of relevant backstory, such as Disney’s reluctance to work with authoritative women and Travers’ fraught relationship with her adopted son, Camillus. It focuses primarily on the supposed origins of Travers’ famous fictional character, which the movie places squarely in her difficult childhood. But does it do justice to the working relationship of Disney and Travers? Kelly Marcel, who shares screenwriting credit with Sue Smith, has said in interviews that she drew on a wide range of sources, including Mary Poppins, She Wrote: The Life of P.L. Travers by Valerie Lawson and Disney’s archives. Using Lawson’s book and published interviews with Marcel (an interview request placed through Disney was ignored), plus previous considerations of the film’s veracity, I sorted through the fact and fiction of the film, with an emphasis on the Disney-Travers relationship. Here’s what I found. When we first meet Pamela, in 1961, her agent is trying to persuade her to sign over the rights to Mary Poppins to Disney, seeing as her books are no longer selling as they once did and she could lose her cozy London house. After initially refusing, Pamela travels to California to meet with Disney’s creative team: screenwriter Don DaGradi (Bradley Whitford) and songwriting brothers Richard and Robert Sherman (Jason Schwartzman and B.J. Novak), as well as Disney himself. As Lawson notes in her biography, Travers did indeed travel to the Disney studios in April of that year (and stayed in the Beverly Hills Hotel, as Pamela does in the film). There she spent 10 days in meetings with the team, offering criticisms of their work. But the major conceit of the movie—that Pamela’s visit is a cat-and-mouse game, with Disney and his team attempting to persuade her to sign over the rights—appears to be a flight of fancy. Walt Disney’s company and Travers’ publisher, John Lyndon Ltd., had already signed a preliminary agreement in April of 1960 and a six-year “service agreement” in June of that same year before she visited the Disney studios. Under the terms of the latter contract, she had also submitted a treatment for a Mary Poppins movie to Disney a couple of months later and was to receive a “$100,000 down payment against the percentage she would receive from the receipts of the film” (which would be 5 percent of the producer’s gross). Lawson suggests that Travers was anxious that the project had fallen through when he was slow to respond to her treatment. Like Pamela in the movie, Travers insisted that the movie not be animated and asked for full script approval. We know there was a conversation and he convinced her to give him the rights. What happened in that conversation? No one will ever know because it was a private conversation between he and Pamela. So I had to decide how I felt she gave him the rights and actually it came very late in the writing of the script for me … I found this book talking about his dad and the paper route and the snow and how he really had quite a harsh childhood. I was like ‘Oh my god, They’re the same person!’ Of course they are, they had the same childhood. Another visit seen in Saving Mr. Banks may never have occurred at all: Pamela and Walt’s trip to Disneyland. Lawson’s book makes no mention of the two attending the theme park together, and I can find no evidence elsewhere of this happening, either. Travers, like Pamela in Saving Mr. Banks, insisted that the movie adaptation of Mary Poppins not include the color red. (The movie suggests that this demand had to do with seeing her father cough up blood when she was a child; it was more likely an arbitrary demand meant to irritate the creative team.) Travers also fought against Americanisms in the script, including the song “Let’s Go Fly a Kite.” (As seen in the movie, she preferred “Let’s go and fly a kite.”) Citing recordings of their meetings, Lawson describes the Disney writers as “deferential” and Travers as “anxious and dictatorial,” and the movie hews closely to those descriptions. The movie skips over the filming of Mary Poppins and ends with the American premiere at Grauman’s Chinese Theater, which Pamela invites herself to after failing to receive an invitation from Disney. This did happen—though Travers, who was visiting the United States at the time, announced that she would be coming via telegram rather than in person at Disney’s office, as shown in the movie.